I’m a big fan of Thip Khao’s Chef-Owner Seng Luangrath. Her terrific Laotian cooking, sure, but also her pioneering spirit. 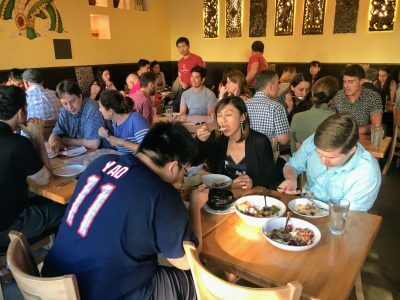 She took a cuisine that most DC residents had no familiarity with and almost single-handedly created a market for it, starting first in Falls Church at Bangkok Garden Thai restaurant with its “secret” Laotian menu and parlaying that into her roomy flagship in Columbia Heights. I’ll never forget my first trip to Bangkok Garden to try its secret Laotian menu. 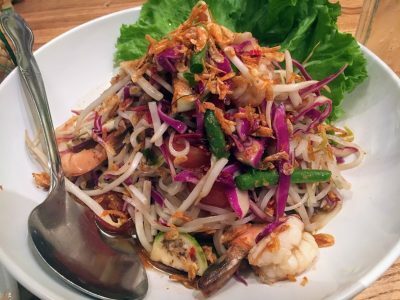 I had no idea what Laotian food was but it was the kind of adventure a foodie like me adores — a secret restaurant-within-a-restaurant serving a new and exotic cuisine. You say I have to schlep to Virginia to a tiny storefront in a nondescript strip mall next to a Home Depot? I wouldn’t have it any other way. I felt like Indiana Jones pulling up cliffside to that temple in Petra. I was pretty sure I’d found my grail. It didn’t quite work out the way I hoped. I screwed up the ordering. My quest turned more Spamalot than Temple of Doom. I had no idea how to navigate the menu and, like any self-respecting male, I wouldn’t ask for directions. But I did manage to order a single dish — the crispy rice salad described below — that blew me away and guaranteed I’d be back. And back I came, as often as I could find someone to accompany me. It didn’t help that most of the press stories about Thip Khao focused on the intimidating aspects of Chef Luangrath’s menu. There’s the separate “jungle” menu with its challenging ingredients like duck heads, tripe and pig’s blood sausage. 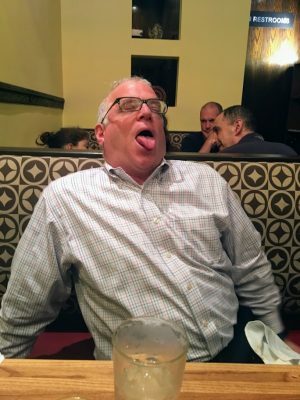 And then there’s the heat levels of some dishes like the papaya salad that caused even a jaded diner like Tom Sietsema to report that he couldn’t tell whether he was chewing on molten iron or a Roman candle exploded in his mouth. Thanks a bunch, Tom. 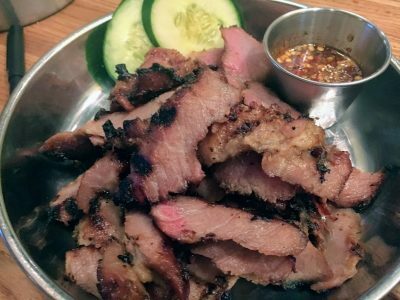 I discovered that unless the person you’re trying to convince to give Laotian food a shot is looking for a conversation-starter the next time they run into Andrew Zimmern, the thought of chewing on molten iron isn’t exactly a selling point. The good news is the hype is overblown. 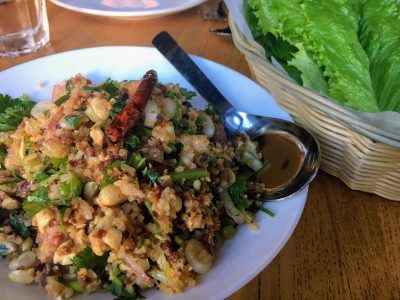 While the menu does contain some daunting dishes, most of the food at Thip Khao is actually pretty accessible — far more so, I’d say, than a place like Little Serow with its set menu of mostly spicy dishes. 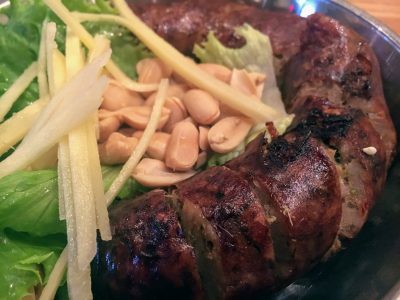 Just about anyone can have an enjoyable meal at Thip Khao. 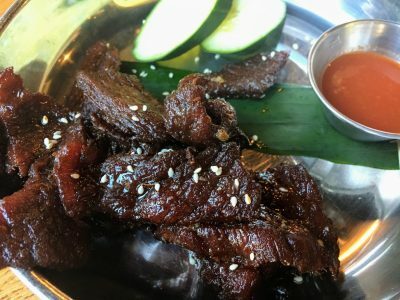 Be sure to start with an order of beef jerky ($12) or pork jerky ($9). “Jerky” is really a misnomer. It’s more like candied meat, tender and slightly sweet throughout. Some dishes are about the quality of the ingredients or the combination of tastes and textures. 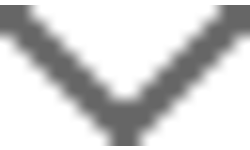 This is about technique. It reminds me of good barbecue, taking some modest cuts of meat and transforming it through time and technique into something delicious. Heat index of 1 out of 10 (with dipping sauce 3 out of 10). This crisp-skinned and loosely-packed sausage is a more savory complement to the jerky. The fresh ginger batons and peanuts provide crunch and freshness, although not clear to me how you’re supposed to eat them together. My technique is to spear the sausage and then grab some ginger and peanuts with my fingers, which just feels wrong. Particularly when I glance at my wife. Still a very manageable heat index — 2 out of 10. 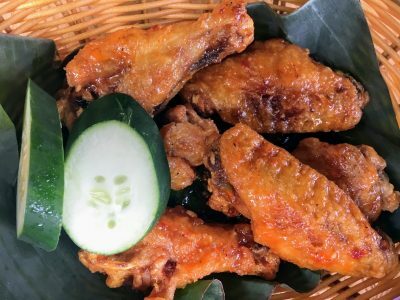 If you don’t do sausage or want to go heavy on the starters, these crispy, well-cooked wings tossed in a mildly spicy-sweet sauce are a solid — if not exactly ground-breaking — choice. Heat index — 3 out of 10. Good choice if you’re looking for some tender, grilled meat and want something less sweet than the jerky. By this point, you may wonder if the two-cucumber garnish is the equivalent of the two-pickle rule on McDonald’s hamburgers (the five of you out there who saw The Founder know what I’m talking about). Still very mild. Heat index — 1 out of 10. 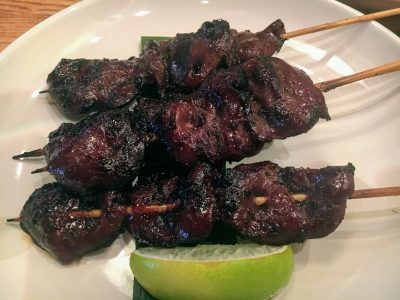 These chicken hearts are on the Jungle Menu but are really more odd than challenging. They taste like meat with the mouthfeel of calamari. You’re better off sticking with one of the other grilled meat options. Heat index — 1 out of 10. 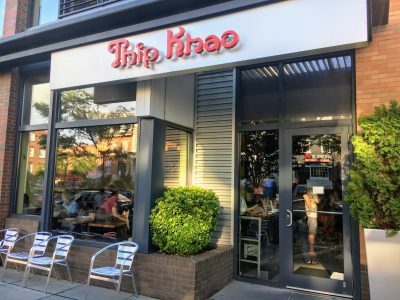 This is where Thip Khao shines the brightest. They make salads that are second to none. Focus your meal here and you won’t be disappointed. The mother of all must-orders, the dish that turned me onto Chef Luangrath’s cooking back at Bangkok Golden. Most tables will have this rice salad on their table and for good reason. It’s crispy, crunchy, herbaceous, porky and flat-out wonderful. Wrap some of the rice salad in the accompanying romaine leaves and enjoy. Heat index — 2 out of 10. The laab may be my second favorite dish at Thip Khao. 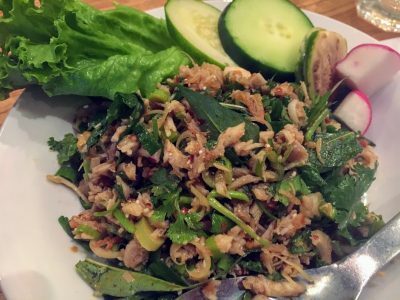 Laab (aka larb) is often sloppy and overly acidic in Thai restaurants. Here it’s a balanced symphony of flavors that is constructed with care. Take some of the sticky rice between your fingers and use it like bread to scoop up some of the laab. (My only complaint is that the waitstaff doesn’t explain any of this to novice diners.) Heat index — 4 out of 10. Sticky rice is the national dish of Laos. Laotians eat more sticky rice per capita than any other country in the world: 345 pounds per year. I’m no math major but I think that comes out to almost a pound of rice every day. By comparison, Americans eat less than 20 pounds of rice a year. Take that, Dr. Atkins. 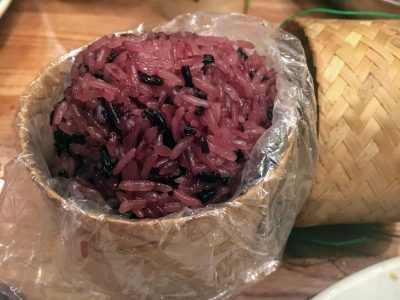 About a year ago, the restaurant had to beg the public to stop stealing the restaurant’s namesake, these cute little sticky rice baskets called thip khao. The supply of baskets dropped to such low levels that instead of everyone at the table getting their own rice basket, the restaurant now delivers a single rice basket with dishes that need it. This is why we can’t have nice things. 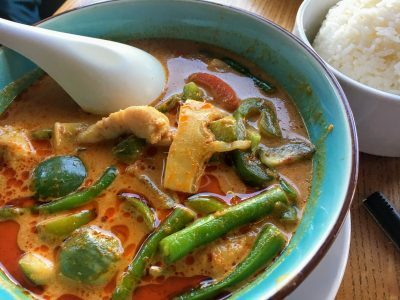 Solid, moderately spicy red curry that would be right at home in a good Thai restaurant. Heat index — 3 out of 10. 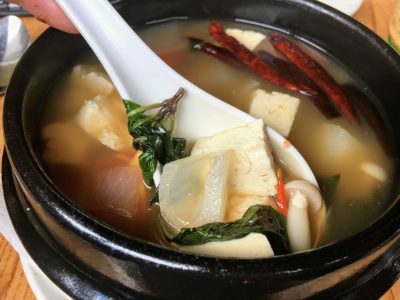 Soothing and nicely-balanced tamarind broth, but a hard dish to share and ultimately not as interesting as other choices. Would make a light and healthy lunch if you find yourself dining alone on a crisp fall day. Otherwise, skippable. Heat index — 3 out of 10. The Lao version of pad thai, complete with scrambled eggs, peanuts, bean sprouts and lime. 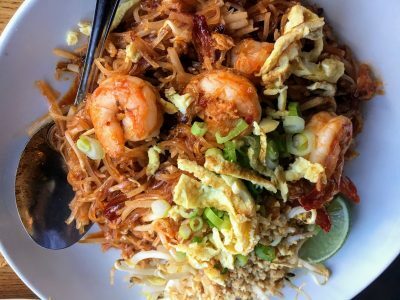 Only order if you like your pad thai on the saucy and fruity/sweet side. Heat index — 3 out of 10. When the menu says extremely spicy, believe it. I like to think I’m pretty impervious to heat and started shoveling a few forkfuls of noodles into my mouth, enjoying the cool noodles and the funk of the padeak (fermented fish sauce) and shellfish paste. And then it hit me. And didn’t stop hitting me. And then kicked me down the stairs and left me for dead in the street. Luckily, the waiter noticed my distress and dropped off a pitcher of water that I may or may not have plunged my head into. Heat index — 9.999 out of 10 (if sucking on a blowtorch is 1o out of 1o). 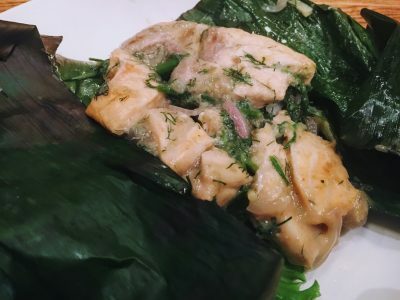 It’s fun to unwrap a little present of fish wrapped in banana leaves. And much of it is a nice surprise, moist and full of flavor, particularly if you like dill. My only quibble is the portion is a bit meager for $19. Heat index — 1 out of 10. 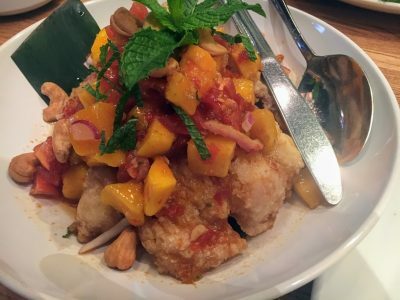 An interesting dish, the hot and crispy catfish playing off against the cool mango-tomato relish. Who knew that mangos and tomatoes went so well together? One of the few dishes I tried that aimed for an elevated level of heat without taking it into the stratosphere. Heat index — 6 out of 10. 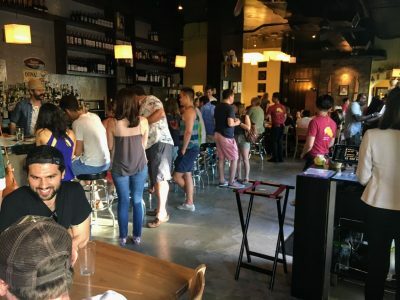 Thip Khao’s large, airy space and outdoor patio is pure Columbia Heights and a far cry from the cramped quarters of Bangkok Golden with the steam table against the wall and TV above the bar.